I was getting a lot of email from L.L. 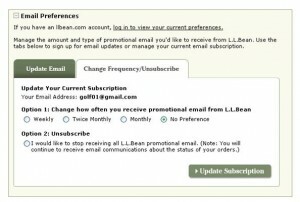 Bean, and decided to unsubscribe. On the unsubscribe page, I saw the above image. Instead of just unsubscribing, it gives me the option to change the frequency that I receive email from them. This may be old hat in the email marketing community, but I found it interesting enough to share. It actually caused me to change my frequency, and keep me from totally unsubscribing. Job well done L.L. Bean!